The allrounders for wet and dry! The wet and dry Kränzle Ventos E/L vacuum cleaners are real allrounders equipped with perfect technology. Their innovative design principle enables a significantly better use of the filter bag in comparison with other suppliers. And the electronically adjustable vacuum power control serves to provide only as much suction power as is needed for the job. 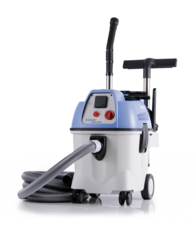 Additional technological and practical details transform the Kränzle Vento into a wet and dry vacuum cleaner that you do not want to do without. The cutting-edge construction processes maximise the available container capacity for using a filter bag. The bag can use much more of the space inside the container compared to the filter bags of similar machines. The power tool electrical socket enables the direct connection of power tools that have an extraction feature. The switch-on delay causes the vacuum to start after the electric power tool, so preventing current peaks and possible tripping of the fuse during the starting process. The delayed cut-out allows the residual dust to be sucked out of the suction hose. The work area and hose are always left clean when the work is completed. 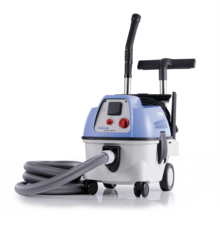 The suction power control allows the suction to be adjusted to the required level. This makes it impossible for nozzles or power tools to “stick” to smooth surfaces due to too much suction. The filter elements are dirt-repelling, washable and extremely durable. They can be replaced easily without tools. Kränzle water suction feature without change of main filter cartridge. The compact structure with its low centre of gravity guarantees a firm foothold even on rough surfaces and during transport in vehicles. The compact design with rounded edges facilitates carrying on scaffoldings and stairs.